Maggie Xiao of Prof. Candler’s group awarded Best Student Presentation Award @ 2019 Jt. MMM-Intermag Conf. 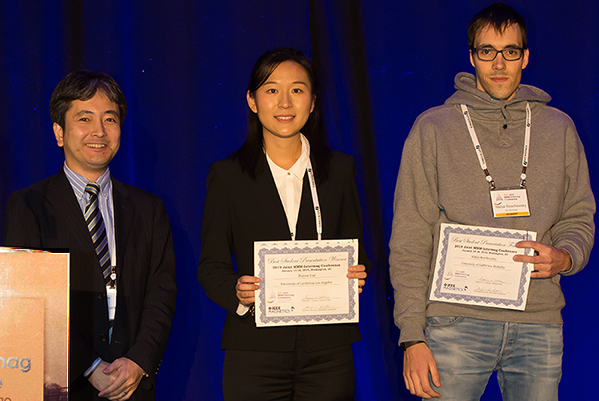 Zhuyun (Maggie) Xiao of Professor Rob Candler’s research group was recently awarded the Best Student Presentation Award at the 2019 Joint MMM-Intermag Conference. The conference includes a wide range of topic on magnetism and magnetic materials and has historically drawn more than 1800 conference registrants, of which more than 500 are students. The pool of student presenters was narrowed to five finalists and from this group, Maggie’s work on single domain magnetism for particle and cell manipulation was chosen for the Best Student Presentation Award.